You’ll know when you’ve come up with a good title when other people start copying it. Thanks Jason! 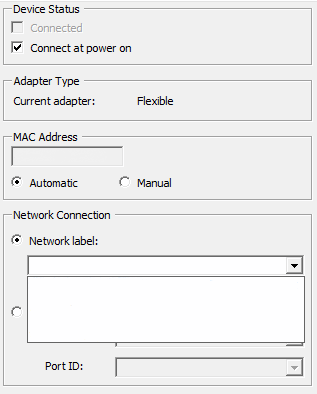 To make matters worse: I could not select the correct network label (Port Group) in the drop down list. After some long and hard thinking, I figured out why: ESX couldn’t communicate with vCenter to update the dvSwitch’s status. This is simply because the vCenter VM was one of the migrated VM’s, and thus suffered from the same problem: it wasn’t connected to the network. How’s that for a catch-22! As I said earlier, the physical hosts run on a single vmnic. No easy fix here then, I cannot create a standard vSwitch, create a port group on it, add a vmnic and migrate the vCenter VM to this port group to get the VM online and thus be able to get the other VM’s attached to the right (dvSwitch) Port Group, after which I can migrate the vCenter VM to the right PG. I had to break the dvSwitch on the physical host by removing vmnic0 and vswif0 from it and attach it to a standard vSwitch. As you cannot migrate a vmnic and a virtual adapter like the Service Console Port at the same time, I had a major problem. Migrating either would mean that I would lose all connectivity to the host. Getting them both attached to a standard vSwitch was my only way out of this conundrum. I need to fall back to the CLI for this one! I had restored the original setup: a simple standard vSwitch with a Service Console Port and a Virtual Machine Port Group. VMnic0 provided the link to the outside world. I moved the vCenter VM to the VMTMP Port Group. 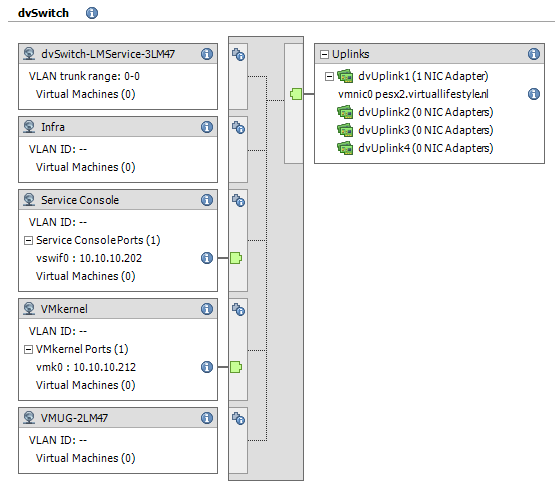 vCenter and ESX could finally negotiate details on the dvSwitch, so I could get on with it, attaching all other VM’s to the correct (dvSwitch) Port Group. The last VM to go was obviously the vCenter VM, as doing so would result in the VM losing connectivity to the network again. I quickly dove back into the CLI and reversed the commands I had just given to attach the Service Console to the dvSwitch again. Wow, what a way to go to get a couple of VMs to the correct Port Group, phew! Of course, having just a single NIC in a dvSwitch environment is BAD. I was just too lazy to arrange some extra NICs for these desktops because I’ll only be using them temporarily. That being said, I learned first hand why a hybrid solution (which requires multiple physical NICs) is a great idea. For further reading on hybrid environments, please do check out VCDX 007’s post on it!